UPDATE 1/16/18: We are SO excited to announce that the $24k in donations will be distributed on Sunday January 28th in Cascade Locks at a special celebration honoring our Gorge Heroes. We have invited each fire department to attend and receive their gift made in honor of their volunteer programs. THANK YOU. We will close this fundraiser on Wednesday 1/24/2018, so if you would like to make a contribution you still can! KEEP SHARING! UPDATE 9/23/17 12pm: Hip Hip Hooray! WE DID IT! $20k raised for our Gorge Heroes in just 20 days. I am still working on identifying the Gorge volunteer fire departments that responded as part of our mutual aid agreement in Cascade Locks. Additional donations will be shared accordingly amongst our Gorge heroes. In all honesty, I wish we could make a gift to ALL the crews working. Please, if you are unable to make a gift here, please consider supporting your local volunteer fire departments wherever it is that you call home. Sincerely, Caroline Park Thunder Island Brewing Co.
"How can we help?" This question has been on many people’s minds since Sept 2nd, when a wildfire started along the Eagle Creek Trail one mile from Cascade Locks, Oregon in the Columbia River Gorge National Scenic Area. 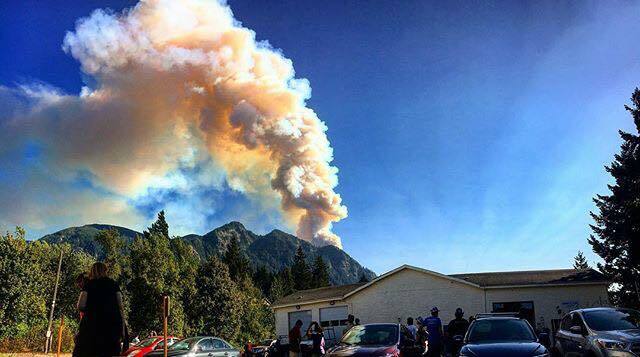 Currently, the fire has spread to 33,000+ acres and has jumped across the Columbia River into Washington state. As of today, there are over 900 first responder personnel working on this fire from across the Pacific Northwest. We are so grateful. As residents and business owners in Cascade Locks, Dave and I have experienced the reality of a raging wildfire first-hand. Hundreds of families and businesses received mandatory evacuation notices at dawn on Sunday 9/3. Many more were notified that they may have to leave at a moment's notice. It is terrifying to leave your home, neighbors, friends and business behind and be forced to wait, but our hearts are comforted knowing that our first responders are here to provide support to our community. 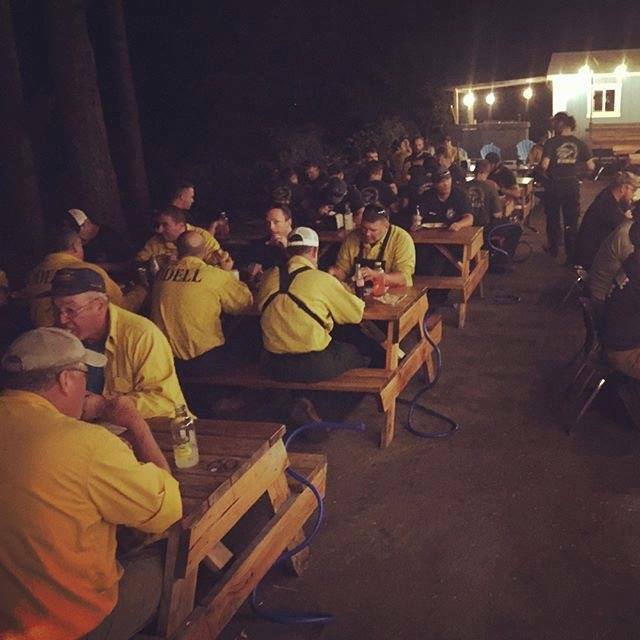 In the first few days of the fire, the Thunder Island Brewing Co crew had the honor of meeting and serving a hot meal to many of the incredible women and men working around the clock to protect our beloved Columbia Gorge . 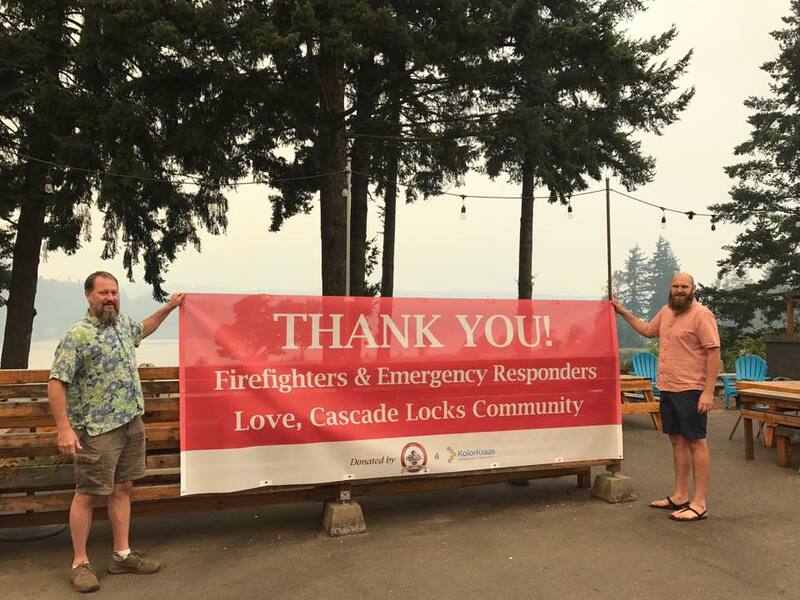 It has been an honor to play a small part in keeping these men and women fed throughout this experience alongside our fellow Cascade Locks businesses and community. 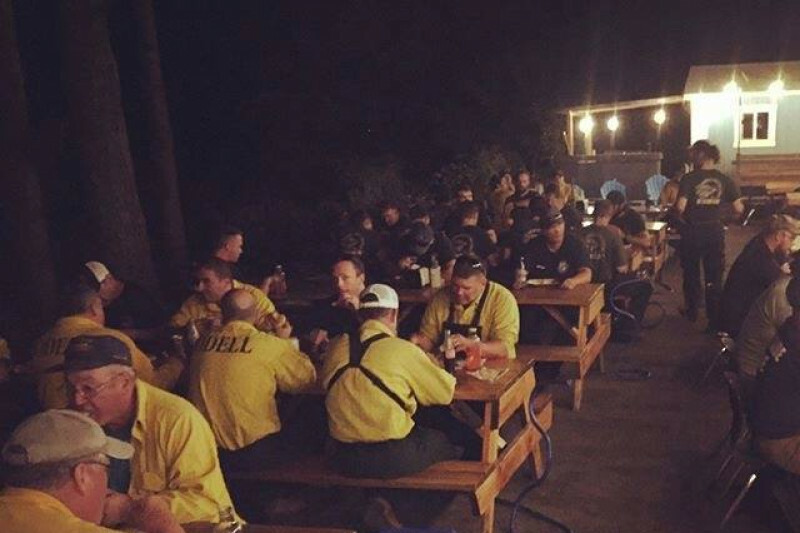 ￼"First responders resting and eating a hot meal at Thunder Island Brewing 24 hours after the fire started"
Please take a moment to recognize these fire crews with a donation to honor their hard work keeping us safe. Our local Gorge fire departments are VOLUNTEER-based, meaning they operate on a fraction of the resources that others do. They need our support now more than ever to continue to have the training and equipment they need during times like these. Right now, as we watch, and wait, we are so humbled and grateful for the outpouring of support from our friends and customers. And above all, we are incredibly grateful for the first responders from throughout the Pacific Northwest who have been working in dangerous conditions to save our homes. We kindly ask you to consider consider making a gift to honor our local Eagle Creek Fire heroes here today. Thank you for your generosity and for keeping the Gorge in your thoughts. 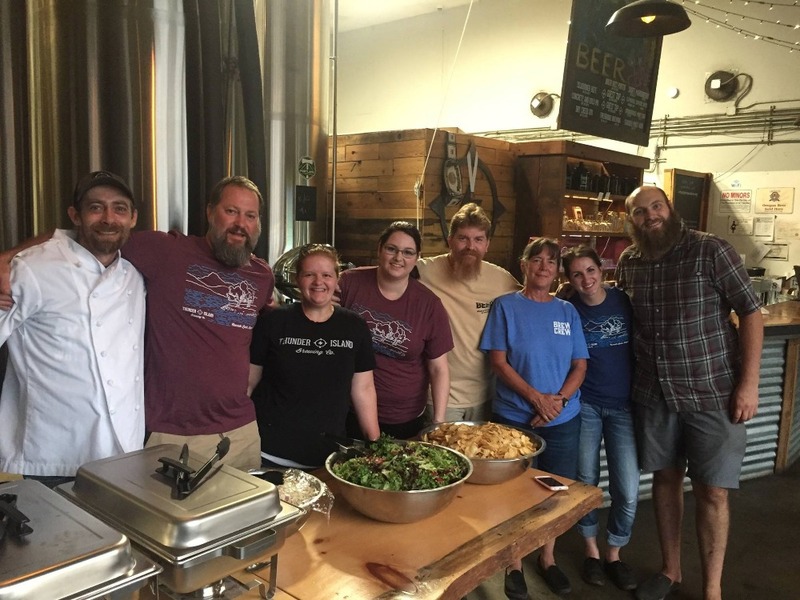 "Thunder Island Brewing staff and friends feeding fire crews on Sun 9/3/2017"
Caroline Park and David Lipps are the owners of Thunder Island Brewing Co, and residents of Cascade Locks, Oregon. 100% of the proceeds from this fundraiser will benefit local volunteer fire departments noted here, and additional departments will be identified with the assistance of Cascade Locks Fire & EMS. The proceeds of this fundraiser will be presented to each beneficiary in the form of a check from Thunder Island Brewing Co to each identified fire department. We will honor our Gorge heroes at a public event to present their check at a future date when the threat of evacuation has ended. All donors are cordially invited. Details will be sent as soon as a date and location for the celebration is determined. We look forward to this special celebration honoring our Gorge Heroes. We have invited each fire department to attend and receive this gift for their volunteer programs. THANK YOU for your support and patience as we have worked to distribute your gift. We will close this fundraiser on Wednesday 1/24/2018, so if you want to help make a bigger difference, please share this campaign. WE DID IT! $20,000 raised for our Gorge Fire Crews in just 20 days since the Eagle Creek fire started. Thank you for your gift, and for sharing this post, and for helping us generate support for our Gorge Volunteer Fire Crews. 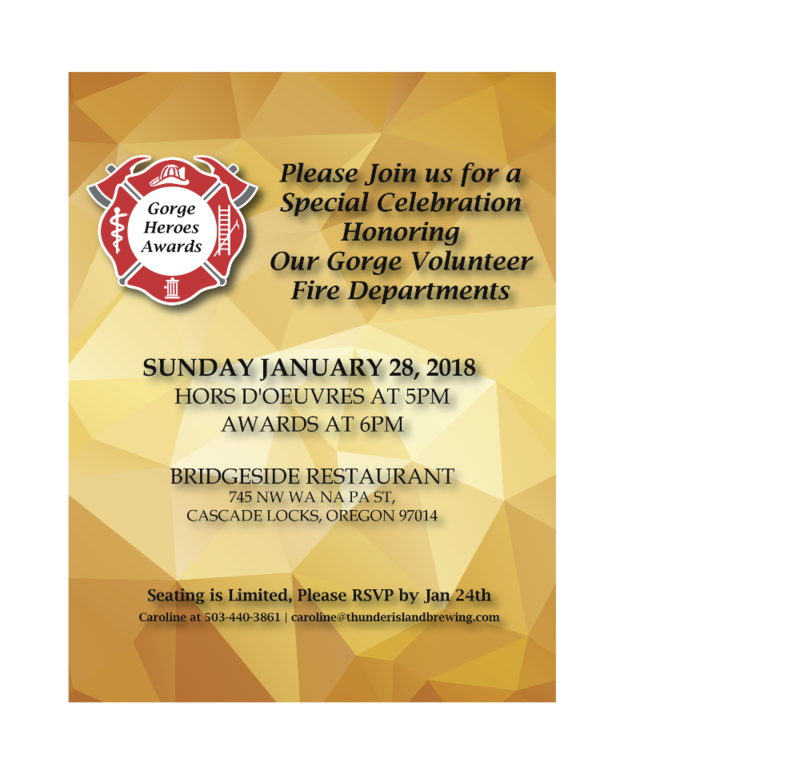 Stay tuned for the big celebration to be scheduled in Cascade Locks (Date TBD), we have some very generous checks that we will be presenting to our Gorge Volunteer Fire Departments. 100% of the proceeds for this fundraiser will be presented to our Gorge fire crews. On behalf of Thunder Island Brewing Co, we are so honored and delighted to facilitate this donation. Thunder Island Brewing will keep the fundraiser open until we present the checks at our an upcoming public celebration. We cannot thank our heroes enough! Wow. $19,226 in donations for our Gorge Volunteer Fire Departments. This is incredible. Thank you so much for your support! Please consider sharing our campaign one last time to help us reach our goal. We only need $774 more to meet our goal. Help us make it happen! I am sorry to have gone quiet this last week, we finally were able to return home one week ago. We still have fire fighters here in Cascade Locks keeping us safe. Stay tuned for information about the event we are planning to present these hefty checks to our fire departments.